The Young and the Restless spoilers and news reveal that Thad Luckinbill is currently on the set of Y&R, and appears to be filming new scenes as not-so-dead J.T. Hellstrom. The official Young and the Restless Twitter account shared a snapshot of Thad Luckinbill on the set and working. Whatever scenes Luckinbill is filming will most likely air in a few short weeks. 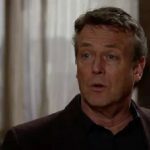 Young and the Restless spoilers show that the Genoa City PD is very close to charging multiple members of the cover-up crew with J.T.’s death. If Victoria’s ex is still alive, now would be the time to reveal it. One could argue that Luckinbill is filming flashback scenes, however Y&R has been using old footage of him so far in this storyline. It would be odd for them to suddenly bring him back to reshoot his death scenes. Regardless of what kind of scenes Thad is filming as J.T. Hellstrom, one thing is for certain, the soap opera is finally wrapping up this nearly year long storyline. Bold And The Beautiful Spoilers: Real Housewives Star Denise Richards Joins Cast!